Metro Denver is blessed by miles and miles of dedicated, multi-use trails. 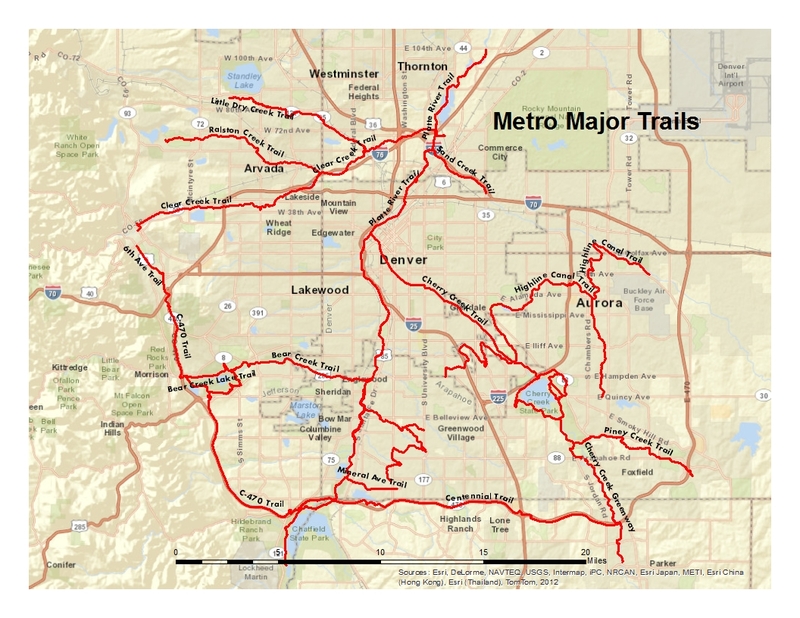 Shown here, in a map revised and adapted from Great Road Rides Denver, are the major paved (mostly) trails systems in the metro area. I say “mostly” because a few sections shown here are neither concrete nor asphalt, like the quarter-mile section of dirt between the Platte River Trail and the Sand Creek Greenway. They are just plain dirt, crusher fines usually, but still easy enough to ride on. The trails shown here add up to more than 200 miles. Were you to add in the shorter stretches of dedicated trails, the many miles of unpaved trails, and the stretches of streets and roads with dedicated lanes, you would easily have more than 600 miles of roads and trails. If you are new to cycling or to the area, this is a good place to start. But don’t stop there, as so many do. On weekends, the trails are becoming more and more crowded and less and less friendly. This is especially true along Cherry Creek and south from Confluence Park along the Platte River Trail. So use them when you need to, but get out there and see the rest of the city. Ride the streets. Especially on the weekends, when there’s less traffic than during the commuting hours. Ride to Arvada or Golden or through Lakewood. See the Coors Beer operation up close and personal or wander on your bike through Crown Hill Park. Take in Loretto Heights or the urban hipness of the Highlands. Stretch on out to the farthest reaches of the city with a loop out to Bow Mar Lake. Wind around the perimeter of Stapleton or find the secluded copse of cottonwoods past the Anschutz Medical Center along Sand Creek. By my unofficial count, there are at least 25 distinct municipalities in the Denver region. Ride to or through each one of them. Buy the book if you’re not sure where to begin, or track down one of the free urban bike maps that are available. If you find yourself riding the same route day after day, decide today to go somewhere new. Get off the trails. Get out on the streets, and have some fun. And remember: Never let the anxiety of being lost, interfere with the enjoyment of not knowing where you are.